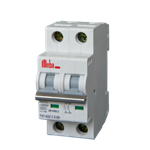 A miniature circuit breaker is a device that switches and/or protects the lowest common distributed voltage in an electrical system. It is designed to protect conductors and insulation from damage due to overload short circuit. Our MCBs are not only famous for quality and reliability ,but also diversity of types , meeting all your demand.